Slacklining is just walking from one end of a rope to the other right? The idea behind slacklining is very simple. All you need is two trees and a slackline, but there are so many diverse styles and navigating your way across said slackline is considerably more challenging than one might think. Since the sport is only recently coming into the mainstream spotlight, not much is known about the origins of it so before today’s list comes a quick history lesson about the man behind the recent rise in popularity! 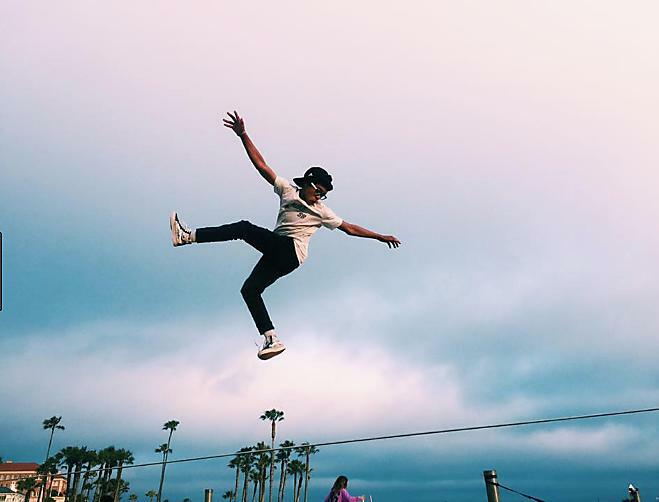 The idea of walking across a rope has been around in one form or another for thousands of years, but the origin of slacklining can be traced to a young rock climber named Adam Grosowsky. When Adam was 16 years old he passed a picture in a university library where his father worked that really caught his attention. The photo depicted a wire fixed low on a wall on one end and the other end stopping with a wrist loop. This loop was held by a performer doing a one-hand handstand on top of a flagpole with his body contorted to one side to counterbalance the weight of the wire. In the middle of the wire held by the first performer was a second performer also balancing in a handstand. Adam became obsessed with recreating this photo, but he fell short. Through his hours of practice and frequent public displays of skill he greatly aided in the popularity of the slackline movement! With a sport as simple as slacklining there is a huge amount of room for innovation and personalization. Each person develops their own personal style of slacklining based on location, tightness of the line, and thickness of the line. Listed below are 7 of the most popular styles of slacklining! 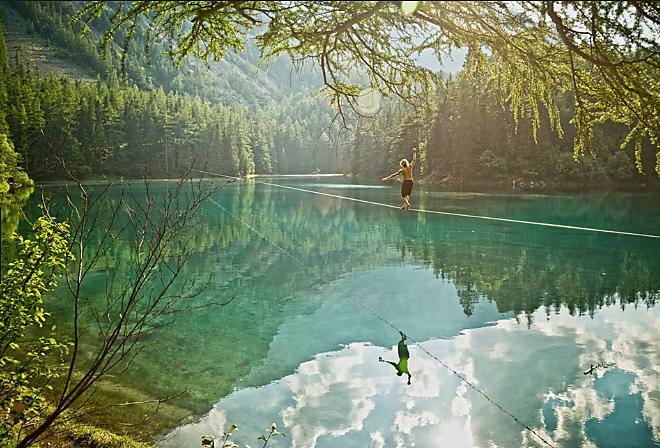 Tricklining is probably the most common form of slacklining due to the minimal setup required. 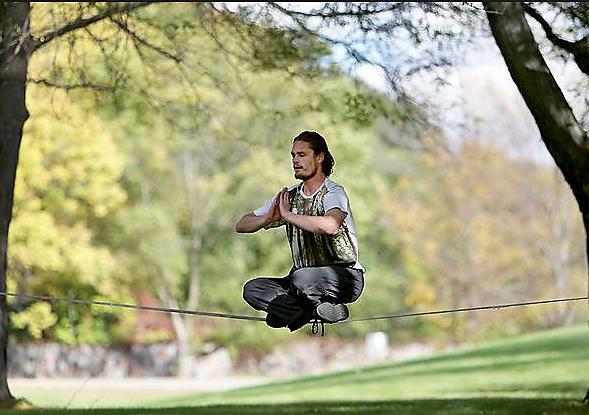 Some of the more basic slacklining tricks are backward walking, turns, and bounce walking. Intermediate tricks include lying down, Buddha sit, and jump turns. The most advanced techniques even include things such as jumps, 360s, chest bounces, and flips. Someone with limited experience must be extremely cautious with the intermediate and advanced moves as they should only be performed by a slackline pro. Two inch slackline kits are optimal for this particular style. Waterlining is done over any body of water. The line can be set up high above the water, close to the surface, or even underneath the water. This style is great for beginners who are looking to practice the more advanced tricklining techniques without the risk of injury! Pools, lakes, rivers, creeks, and between boat docks are all common places to set up but take precaution. It is extremely important to take a good look at your surroundings to ensure safety for all parties involved. One of the most exciting styles to date is highlining! This style involves setting a line up high above the ground or water and many people consider this to be the pinnacle of the sport. Highlining is an adrenaline rush for participants and spectators alike due to the extreme nature of the activity. The setup of the line is sometimes the most difficult part because of the difficult terrain of some of the locations. High lines are often reinforced with a backup line or climbing rope and the “slacker” is tethered to the line by using a climbing harness. 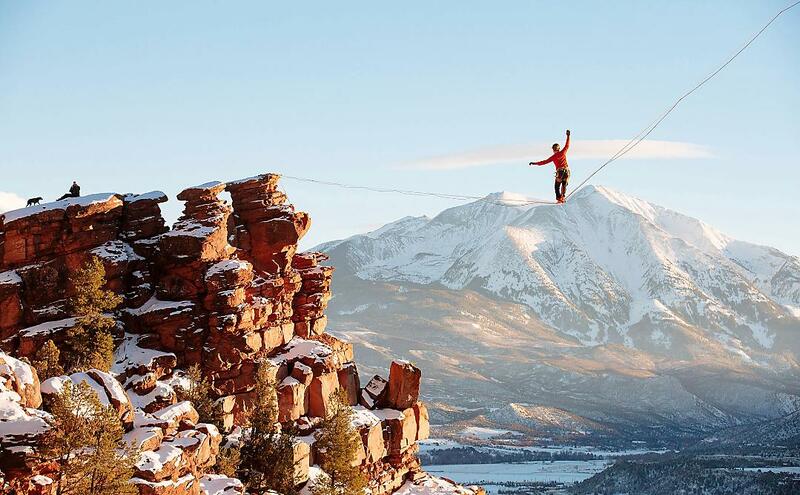 Free-solo or leash-less is the most extreme variation of this style in which the slacker crosses without a harness. Wind Slacklining also known as windlining is performed in extremely windy conditions. The more intense the wind becomes the more difficult it is to stay on the line. Some have compared it to flying in the sense that the slacker must make themselves as aerodynamic as possible in order to maintain balance. 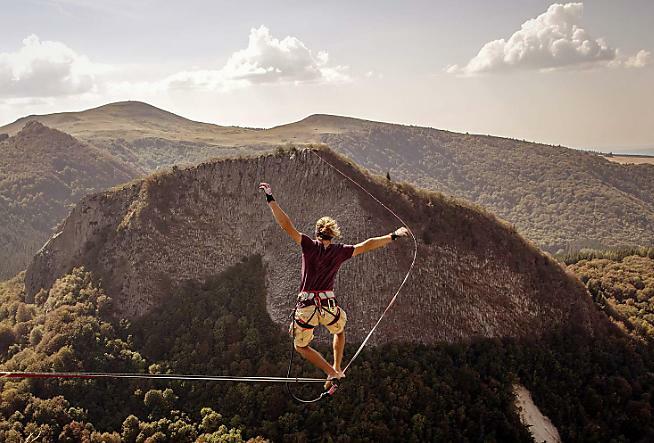 Also know as “rodeo slacklining” is done using the same line as normal but the line has no tension. This adds an entirely new dynamic as the slackline freely swings back and forth uncontrollably. This technique is not used by many people and requires a high level of skill. Balancing on a two inch piece of webbing tensioned between two trees is hard enough by itself. Slackline yoga combines that and traditional yoga moves, making it one of the most difficult styles to master. This exercise simultaneously develops balance, power, core integration, flexibility, and confidence. The most advanced slackers can perform an entire yoga routine without touching the ground a single time! 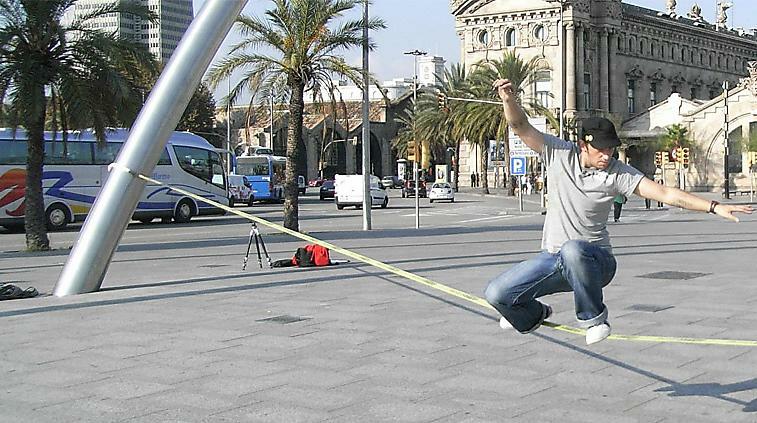 Urbanlining is a combination of many different types of slacklining. Most urban slackers prefer wider two inch lines, but the thinner one inch is used for urban longline purposes. One type of urbanlining is called timelining, where one attempts to stay on the line as long as possible without touching the ground. This technique is an extreme test of endurance and focus, and is great training for various postural muscles! The video below depicts the current world record holders, Nathan Paulin and Danny Mensink, and their incredible efforts to break the world record for the longest slackline. The video opens on a gut-wrenching clip of Mensink losing his balance and falling off of the line. As he dangles there, held on by only a small tether, it is a stern reminder of the task that lies ahead of him. Slacklining even for the shortest of distances requires skill and focus so this world record-setting trek will be the greatest test that the two have faced thus far. The two must walk a distance of 3000 feet, which is the equivalent of 100 football fields placed end to end. Not to mention the fact that slackline is strung between two mountains 1968 feet above the rocky canyon floor! At heights of that magnitude, even the slightest of breezes become a huge obstacle to anyone attempting to cross the slackline. If you will look closely in the video, you will notice the way that the line bends and sways at extreme angles with the wind making it very difficult to judge distance. All of these factors culminate in an absolutely breathtaking video that is almost hard to believe. Watch below, as Nathan Paulin and Danny Mensink set the new world record for longest slackline and write their own page in the slacklining history books! 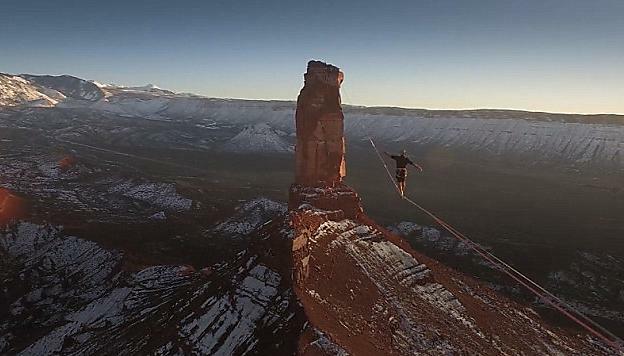 The current record for longest Highline is held by balance athletes Nathan Paulin and Danny Mensik. 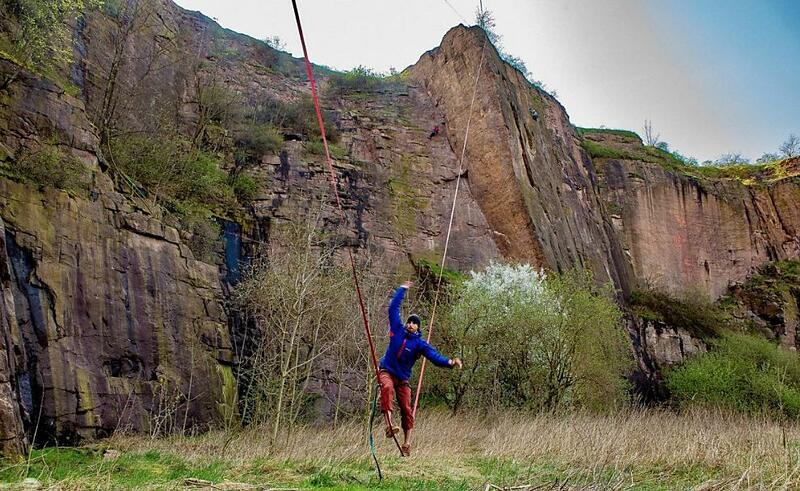 The two daredevils crossed over 3000 feet of Slackine while crossing high over the river La clue d’Aiglun in France! That is the equivalent of over 100 football fields! Paulin finished the trek in one hour and 15 minutes and Mensik finished in just 40 minutes en route to a top spot in the record books. 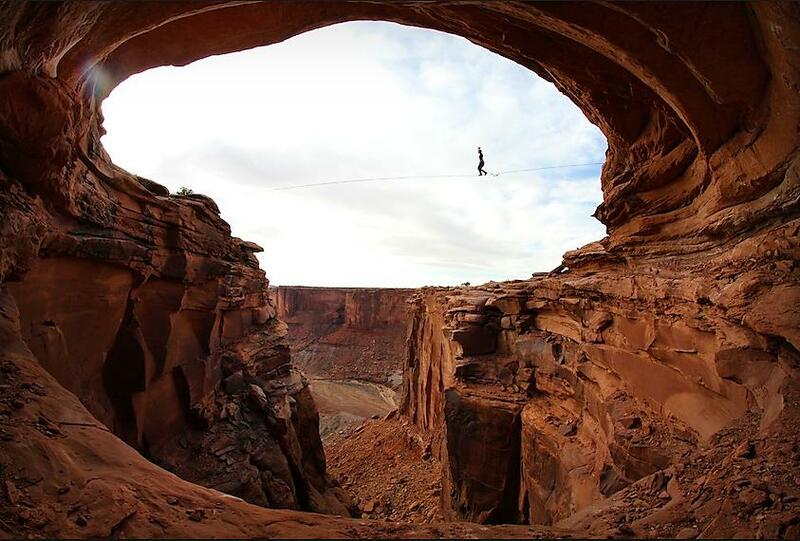 The longest free solo Highline was walked by Friedi Kuhne in August of 2016. The Munich, Germany native traveled to Hunlen Falls, in Northern British Columbia to attempt this daring feat. Kuhne tiptoed his way across 236 feet of rope 1300 feet in the air over a rushing waterfall to claim his spot in slacklining folklore! Now that you know a little bit more about slacklining and some of the incredible feats that have been accomplished in the sport, it is time for you to get out there and make some history of your own! For any of your slackline needs, check out Ratchet Straps USA!